Clinical Psychology, as we know it today, is the branch of psychology which primarily focuses on understanding, diagnosing and treating various forms of mental disorders. Although it is considered to have been officially founded in the late nineteenth century, treatment of mental illness dates back to many centuries ago. The earliest explanations usually attributed mental illnesses to supernatural causes. The early Greeks believed that mental disorders were inflicted by God upon people as punishment for irreligiousness or sinfulness. Others thought that they occurred due to invasion of the body by demonic spirits. Therefore, inhumane procedures were often used to treat the mentally ill, if they were treated at all. One common practice was trepanation, which included chipping away at a person’s skull to rid the body of evil spirits. After Hippocrates (ca. 460- 377 B.C. ), however, people began to accept the notion of these disorders originating from natural causes. This naturalistic approach prevailed until the fall of the Roman Empire and was followed by the reemergence of the supernatural approach, which lasted throughout the middle ages (5th – 15th century). 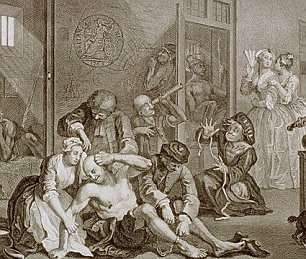 Mental treatment during the Middle Ages was often synonymous with exorcism. People accepted the existence of witchcraft, black magic and sorcery as an established fact. Though heavily frowned upon, it was not until the mid-fourteenth century that it began to be considered as a criminal offence. It might perhaps not be a mere coincidence that this began just around the time The Black Plague Epidemic ended, killing about 50 million people in Europe. During this time, the Church institutionalized persecution of witches. Disorders such as hallucinations, sexual dysfunction, hysteria, epilepsis, mutism, alcoholism and depression were considered to be caused by witchcraft. 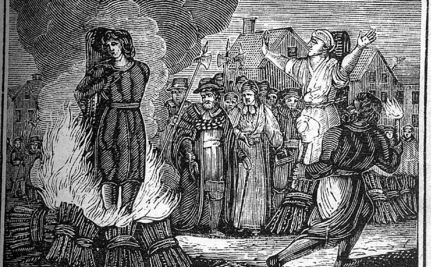 Witch hunts were extremely common up until the mid-eighteenth century. Atleast a million witches are estimated to have been persecuted in this period, and mostly women. But in spite of the prevalent zeitgeist, individuals such as Cornelius Agrippa, Phillippus Paracelsus, Johann Weyer, and Reginald Scot argued against witch hunts and stressed that mental disorders were not caused by supernatural forces. Unfortunately for the mentally ill, they were treated very poorly even after people began to accept that mental disorders were not signs of sorcery. They often roamed the streets or were locked up in asylums, where they were chained, beaten, starved, put on public display for money and subjected to bloodletting rituals and shock treatment. Conditions in asylums gradually improved due to the efforts of individuals such as Philippe Pinel, Jean Esquirol, Dorothea Dix and William Tuke, who advocated humane treatment of patients. Understanding of mental disorders and how to treat them was furthured by the work of Emil Kreapelin, Vincenzo Chiarugi, Benjamin Rush and others, who classified and explained them as having biological and psychological origins. As research expanded the bounds of treatment of mental illnesses, therapy became more structured and effective, the conditions of patients improved drastically and an increasing number of people developed an interest in psychological research. One such individual was Lightner Witmer (1857- 1956), who is considered to have founded the field of clinical psychology. Being a student of Wilhelm Wundt, he initially conducted research in experimental psychology. However, while working in the University Of Pennsylvania in 1896, he treated a 14 year old boy with learning disabilty (which is known today as dyslexia), which fuelled his developing belief that psychology should have practical purposes. He set up a ‘psychological clinic’ at the university and published a paper titled Practical Work In Psychology. Thus began his career as a clinical psychologist. He also launched The Psychological Clinic Journal in 1935 in which he coined the term ‘Clinical Psychology’ and described the clinical method. In 1945, the American Psychological Association created a division for clinical psychology, and though growth of the field was slow, it gradually became more distinguished and vital. World War II turned out to dramatically advance the field, when both physicians and psychologists were called upon to treat soldiers, veterans, and families of soldiers. Developments of other disciplines such as behavioural psychology, psychoanalysis and humanistic psychology further advanced the development and expanded the scope of clinical psychology. In the United States, approximately 33.9 psychologists are licensed per 100,000 population. Clinical psychology has been growing as a profession and is one of the leading fields of academic study and research today. Hergenhahn, B. R., & Henley, T. (2013). An introduction to the history of psychology. U.S.A: Hague.